With a boat the size of the Arctic Joule wind can be a terrible enemy. The prevailing winds through this section of the Northwest Passage are northwesterlies but to date have been nothing but easterlies and northeasterlies. It makes for tough going at the best of times and no going at the worst. As we move to the end of the Tuktoyaktuk peninsula and Cape Dalhousie we begin to shift into a more easterly exposure. Our hope is that this will allow us to take advantage of the traditional Northwesterly helping us along somewhat. But we have a stiff easterly bearing down upon us at the moment and it’s really hampering our progress. On one occasion Frank and I elect to push out to deeper water hoping to find the elusive east moving current that’s supposed to be out there. We’re exposed to the full brunt of a 20km headwind and a negative tidal current as well and are literally pushed backwards, like tissue in the wind. It’s a frustrating and humbling experience but one that reinforces the limitations of our craft. There’s no question that a smaller vessel like a kayak would fare far better in such wind with less weight and less windage hindering movement but with a smaller vessel comes the disadvantages of limited carrying capacity and sea worthiness. The Arctic Joule tips is close to 1200kgs fully loaded and for the power output – two rowers – exposes lots of surface to the wind. Into a strong blow she simply comes to a stop. We struggled with this balance in her design and even contemplated building a smaller, non self-righting vessel but decided to build a robust boat up to the task in these waters. We could have made the hull out of a lighter, less robust material, we could have left our 135lb safety raft behind but we decided that to do this adventure right we needed to do it safely. Approaching an expedition like this in a devil-may-care approach not only exposes the participants to undo risk but also to would-be rescuers who would invariably be called in if something went wrong. The participants have a choice, the rescuers don’t. We aren’t taking this approach. The Arctic Joule is a strong, sea-worthy vessel that performs excellently under certain conditions and not so well under others. We’ve understood this all along and need to bear with it now when she’s under strain. Tough going now but we keep going. The head rose out of the surf with deliberateness and intent, spying on us. The porcelain white form easily breached the water, its bemused expression and bulbous forehead unmistakable: a beluga whale. Our surprise at seeing it was likely matched by its surprise at seeing us, two guys dragging a boat through surf on the Northwest Passage. The landscape here bespeaks an altogether different world than I know but it’s in moments like this, when a beluga surfaces a mere 20 meters away, that this reality hits home to me. It’s difficult to discern one day from the next on this journey as our schedule has us moving 24 hours per day when conditions permit. 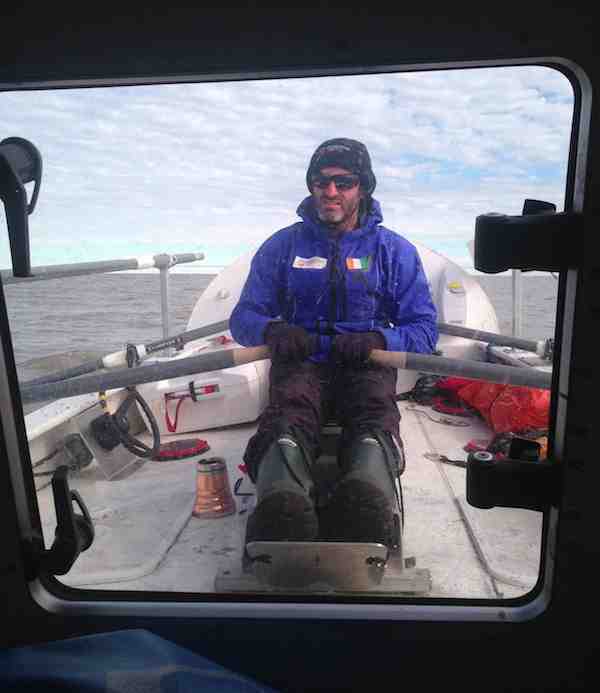 We row for four hours, rest for four hours and repeat until weather or ice interrupt the process. There’s no darkness here either, the sun never sets. Evenings are colder and darker than midday but the ambient daylight even in the middle of the night is adequate to read by. It all takes some getting used to but after living it for the past couple weeks now, it’s becoming a routine. We move up the coast and for the first time begin to see ice flows appearing on the oceanic landscape. They first appear as oddly shaped profiles on the horizon, elongated and stretched, seeming far bigger than they actually are. This is an example of an interesting phenomenon in the arctic that sees objects on a horizon becoming stretched vertically as if manipulated by a lens to peer over the visual plane. Islands can appear much bigger than they are and at times seem to float above the horizon, dark blobs suspended in space. The ice first comes in small pans no bigger then 10 meters square but over the course of the day become more frequent and varied in size. We run into one partially submerged chunk the size of a dinner table that gives us an eye-opening thump. We traverse McKinley Bay in a rare moment of calm, the sea smooth and reflective as a mirror. It’s a magical moment of calm in such an unforgiving environment. “Ah but cares of tomorrow can wait ’till this day is done’ “. Our arrival in Tuktoyaktuk to our departure is less than 24 hours. We rejig the Arctic Joule to work better with our daily routine and resupply on essentials for the next leg of the journey (Hazelnut Coffee Mate being at the top of the list). As with all things, it takes some time to get things right and the journey from Inuvik to Tuktoyaktuk, with all its unexpected delays, proved perfect at flushing things out. The temperature in Tuk is -1C and there’s a strong Northeasterly wind blowing in the morning. Locals tell us it should be 15-20C at this time of year. “The bugs should be bouncing off your head” explained Eilleen who came down to the beach to visit with us. Strange weather has defined the year we are told. It’s been colder than usual and the ice has been very slow in going out. Climate change critics may quickly point this out as a damning argument but the reality of climate change is not reflected in specific anomaly but rather in overall trend. 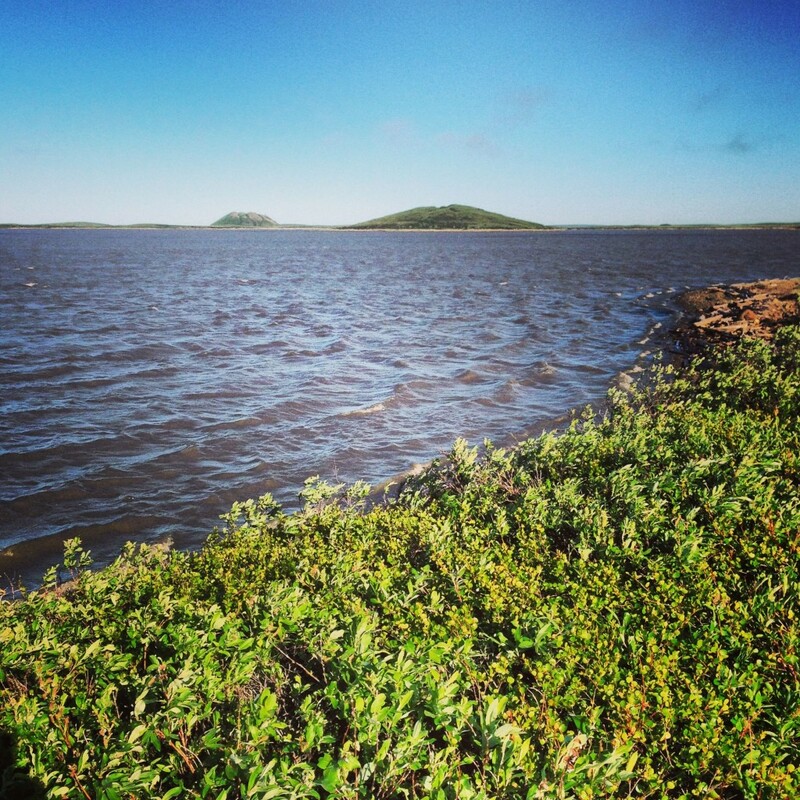 The locals in Tuktoyaktuk describe an Arctic that is in profound change. We are told the summer is longer on both ends by at least two weeks. “They shot a grizzly bear at the north end of Banks Island,” explained Billy, a local elder “They saw a wolverine too”. The words of an elder cuts through the rhetoric of climate skeptics like a scalpel through skin. They know because the live it. We head out of Tuk in the evening. The temperature is still cool but the winds are light and the sea gentle. The landscape is low lying in this region, the sky being the scenic canvas. This evening’s display is an arcing sweep of white cotton ball dabs on a baby blue background. Strokes of light, etched seemingly from a from a dry brush sweep radially across the canvas, the source of radiance somewhere beyond the frame. We move well for 20 hours, pushing against a light northeasterly but riding tidal currents to our advantage. 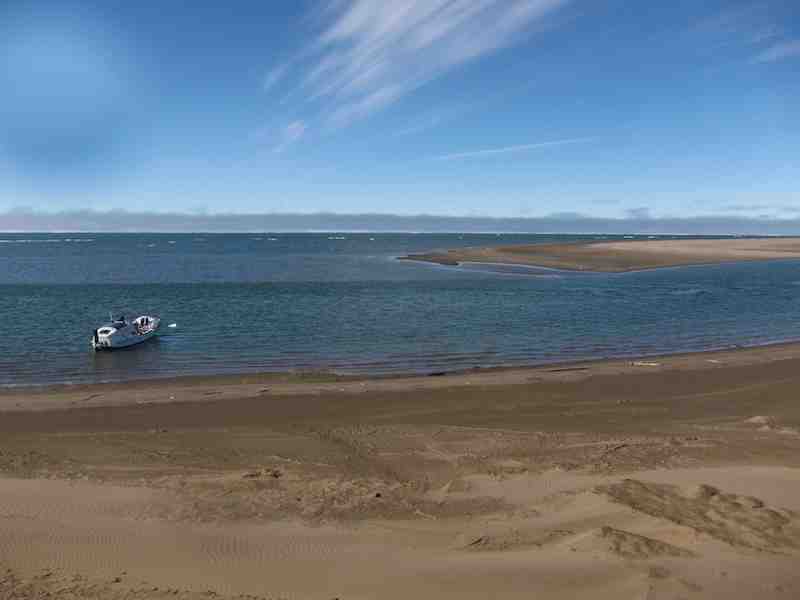 We receive a stern warning from our weather router stating unequivocally: “Unwise to move ahead, you are ready for your route but your route is not ready for you.” We immediately tuck into the lee of a sandy spit and access our options. It would appear that the sea ices not far from us and could be pushed down upon us with these northerly winds. But we need to move as close to the ice edge as possible since we move so slowly and need to be ready to jump when it breaks up. We will maintain forward movement but with heightened caution. The winds build as we muse on our dilemma and before long we’re hunkering down in high winds again. The sun is now replaced with an icy fog and there’s nothing to do but wait. Sunday brings high cloud and lighter winds and a renewed sense of vigour in the team. We’ll move forward, with a sharp eye for ice. The wind finally eased enough to make a move from our haven of the last 3 days. It’s still blowing at 15KNs but we hope this to be a reasonable test to the capabilities of the Arctic Joule. We head out from behind the shelter of our pingo lee and the seas immediately start pushing us heavily back to shore. We struggle to keep the boat at 45 degrees to the wind, side slipping, or ferrying, for the next hour and a half. 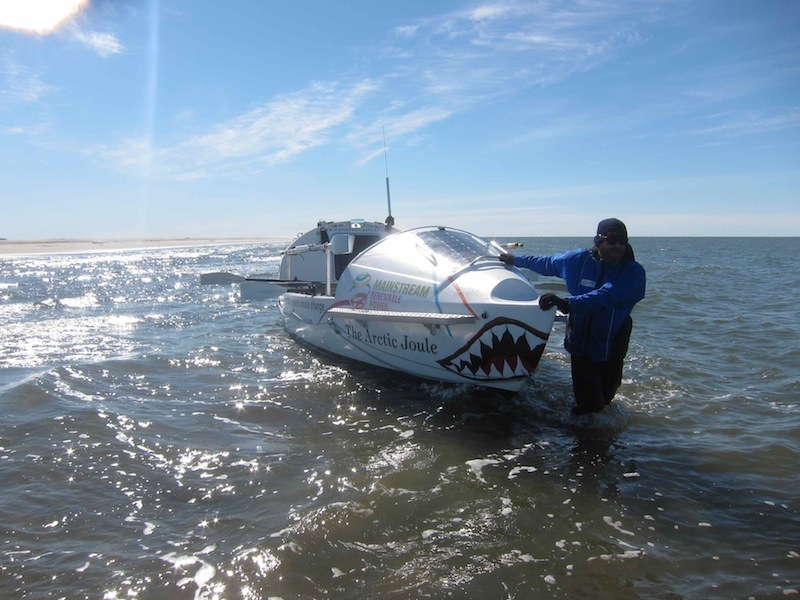 It’s brutal going with little headway so we return to shore and begin hauling the boat along the beach. The waves are crashing fully on the beam of the Arctic Joule and it takes all four of us to manhandle the behemoth through breaking surf. Another hour of work has us round a point where the seas lessen and allow us to row again. It’s perfect timing as rocks have begun to appear in the surf and the Arctic Joule is running up hard against them. The water is still steep and challenging but, in comparison to earlier, is manageable. Finally the homes that we’ve been seeing in the distance for days are in the foreground. We slip into the lee in a small bay at the south end of town and moor on a rocky beach. Within minutes an RCMP truck races down to meet, both officers displaying a degree of alarm. Evidently a resident saw us coming in, rowing what looked to be a disabled boat, and assumed we’d lost a motor and were in distress. It’s 10:00 p.m. Thursday night and we’ve finally made it to Tuktoyaktuk. Day three of the storm and still no movement. The winds are holding at 30KNs and aren’t subsiding. The weather report indicates an improving trend but we’re still to expect 20KN northerlies though tomorrow with a sharp drop in temperature. Flurries are on the table. We’re bearing up well to our forced halt but we’re all anxious to get moving. Having Tuktoyaktuk in our sights isn’t helping matters either. We knew going into this adventure that there would be times like this but, like with all things, concept and reality are always different things. A local reindeer herder in Inuvik wisely advised us that you move on the land when the land allows you to move. Patience is gold to a traveler. We’re moored within a rolling green grassland broken by small lakes and inland waterways. There are no trees here, only pingos rising out of the landscape surround. These low lying grassy hills – distinctive in this region of the Mackenzie delta – rise several hundred feet and are formed by ice pushing up from beneath. On a miniature level they remind me of the volcanoes of Java, Indonesia, perfectly shaped cones marching across an otherwise uninterrupted countryside. We’re idling ourselves by reading, writing and exploring. It’s not often in our hectic lives that we have nothing to do. And the forced break may be a blessing in disguise too. Ice still blocks our route ahead and a strong blow is exactly what’s needed to break things up. We’ll start moving again when we’re allowed. Until then we’ll take the opportunity to enjoy the moment and the place we’re at. It’s been a mystery for over 150 years now. 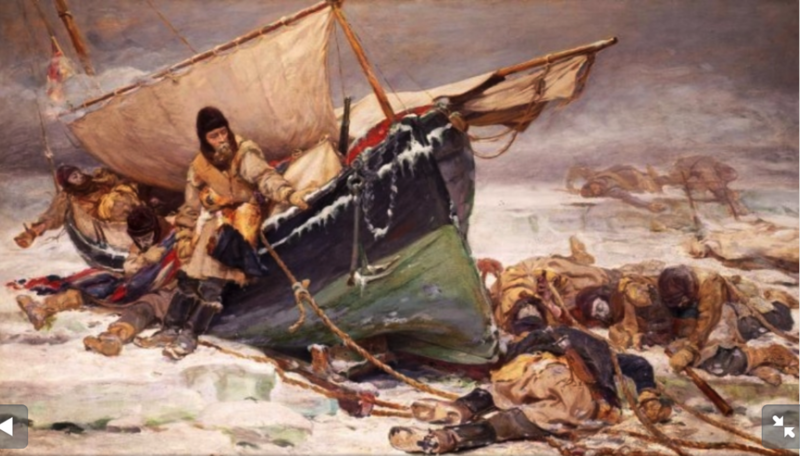 A grizzly discovery on the beaches of King William Island, a large row boat from the doomed Franklin expedition laying abandoned, dead men in their tracks strewn about the boat all clearly in the process of dragging her somewhere. One of the dead men sat at the head of the boat, a gun in each hand, the frozen protector, 25lbs of chocolate stacked at his feet. Our storm didn’t relent today, it strengthened. Thirty knot easterlies shifted to 35KN north-easterlies and made a gale out of a bluster. The winds are too high to row but Tuktoyaktuk is tantalizingly close, just 7.5 km away, and the roofs of its homes are peering at us over the horizon. We decide to push out and by push out I mean exactly that. Our detailed navigation maps and our GPS indicate that a potential route to Tuktoyaktuk exists running through semi-protected channels on the lee side of a series of sand beaches to the north east. Our hope is to push and row our boat through these channels and sneak into Tuk from the back door. After five hours of hauling, lining and rowing we reach a dead end. The channel is blocked with driftwood and is impassable. We retreat. Man-hauling a 2500 lb row boat is a sight to be seen. At times it’s fluid and even graceful but mostly it’s an unwieldy chore of grunting, dragging and pushing, waist deep in frigid water all the time trying to tame a ton of fiberglass that wants to go where a 35 knot wind tells her too. I gained a strange insight into what might of played out on the beaches of King William Island over a century and a half ago. Here we are hauling our over-sized row boat, loaded to the gunnels with gear and chocolate (50lbs in fact)…and two shot guns. Desperation is what happened. We’re at a new moorage point tonight 930 meters further ahead than yesterday. We’re moving forward.